October | 2011 | Where in the World Are Our Kids? In the last chapter of the Gospel of John, the disciples returned to their pre-discipleship occupation: fishing. Maybe it was because they needed breakfast. Maybe in the disillusionment from the crucifixion, they returned to what they knew they were familiar with: fishing. Only there were no fish that night. All night. Talking about kicking a disciple when he’s down! The whole disciple thing hadn’t worked out, and now these fishermen couldn’t even catch a single fish! I think the vague memories of the last time this had happened ruminated in Peter’s mind. It was the day Jesus had called Peter to follow Him. Only then, he was Simon. And this man, this Messiah, came aboard his boat and caused him to have the catch of a lifetime. How many things had changed! It all seemed like a dream, now relived in the context of the frustration of a fishless night. Or so Simon Peter thought. But Jesus stood at the shoreline and shouted to them to throw their nets to the other side of their boats. They did not recognize Jesus by seeing Him. They did not recognize His voice. They only recognized Jesus when He repeated the miracle that He had called Peter by 3 years earlier (Luke 5), by overwhelming their nets with fish. In the midst of disappointment, their senses had been clouded, until Jesus brought the clarity of a miracle. At the first miracle, Peter had fallen to Jesus’ feet and asked Him to go away because he was ashamed of his sin. This time, Peter leapt out of the boat– perhaps in an effort to walk on water again– ultimately to run to Jesus. But what if that disappointment had not been there? What if they had been catching fish all night long? What if they used all their fisherman tricks and really packed the fish into the boat? Would they have longed for the miracle? Would they have even recognized the miracle? Just as Jesus was in the overload of fish, I think Jesus allowed the empty nets too. There have been many times when I’ve thought: God I’m doing all the right things, I’m seeking your will, and I even think that I know what that is, but You’re not cooperating! Perhaps in my disappointment, I have trouble seeing God already at work. God invariably shows up in His own time, and in a way that not only provides for my every need, but fills me with joy because His hand becomes all the more evident in the contrast of frustration and disillusionment. And when He brings the miracle, I begin to see that He’s been standing at the shore of my life waiting for just the right time to provide the miracle. Waiting for me to recognize and run recklessly to Him. I think God allows times of disillusionment to make the miraculous moments all the more meaningful. God, as I wait for Your Hand, help me to see that the times of disappointing deficiency are still a precious part of what you have in store for me. I love making breakfast for our college students on Sunday morning, and with the arrival of fall weather, I thought a hot breakfast bake would hit the spot. I also like recipes that I can set up the night before, and then just pop in the oven in the morning. I came across a couple of recipes — one I’ve had for years and one I’ve never tried — that I could adapt for this morning. I struggled to decide between the two, but with 12-20 in our Sunday school class, I didn’t have to decide between them — I made both! Whisk together: eggs, milk, cream, sugar, vanilla. Pour over bread making sure all pieces are soaked, turning them as necessary to coat. Arrange peaches on top. Sprinkle with brown sugar and cinnamon. Cover tightly with foil and refrigerate for at least 8 hours. Bake covered at 400 degrees for 20 minutes. Remove foil, and bake for an additional 30 minutes until French toast is lightly browned and egg mixture is set. Whisk together: eggs, milk, maple syrup, melted butter. Pour over bread making sure all pieces are soaked, turning them as necessary to coat. Cube cream cheese into centimeter-sized cubes and sprinkle over bread mixture. Sprinkle blueberries over bread mixture. Bake covered at 400 degrees for 20 minutes. Remove foil, and bake for an additional 25- 30 minutes until French toast is lightly browned and egg mixture is set. I made baked them both at the same time, and the sweet fruit and cinnamon smell just about brought me to tears. The blueberry bake was done about 5 minutes before the peach bake. Each serves 8. I served both with syrup on the side, but neither really needed it. 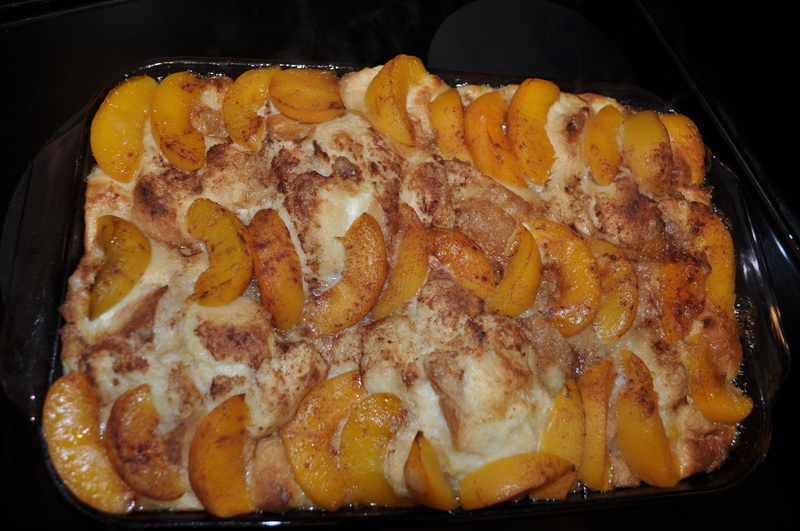 The peach bake was definitely sweet and moist enough without it, and lived up to the deliciousness of its peaches and cream name. 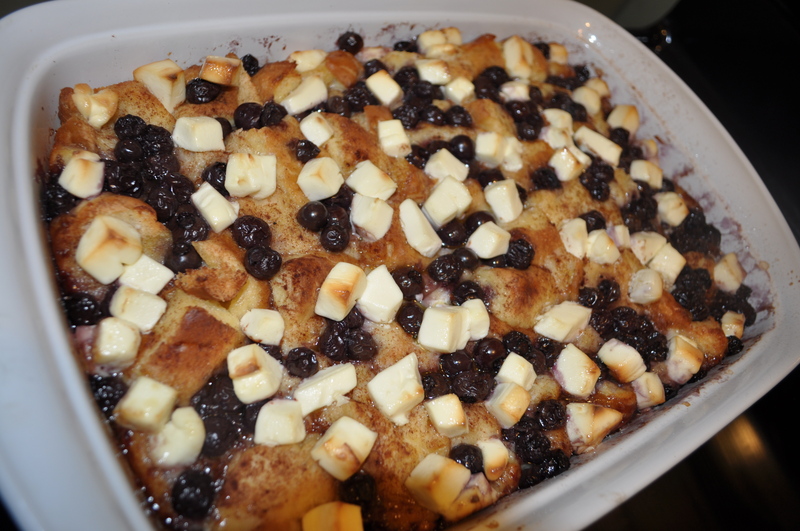 The blueberry was a little less sweet, with great burst of tart blueberries and smooth cream cheese. Both were absolutely delicious. Either would be great for a Christmas brunch, or any time you want to show some college students some home-cooked love. 20 gauge wire and clear beads . 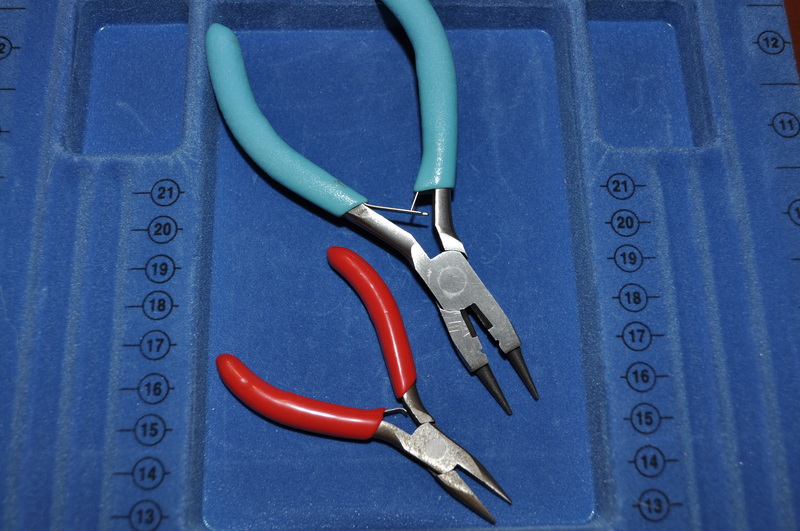 . .
Flat nose and round nose pliers with a cutting tool . 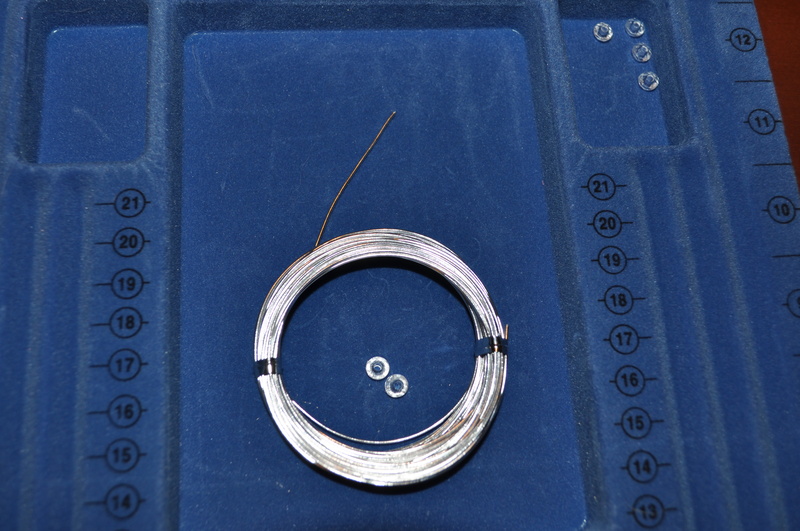 . .
Bend, shape, embellish, add jump rings and some ear wires . . . In case you wonder what’s ever on my mind . . . I must confess: I’m experiencing coupon burnout. It’s not the first time, and I’m certain it won’t be the last. Well, almost certain. I can’t even remember why I stopped at Aldi 2 months ago. It was probably because I had run out of coupons for something, or that I saw Aldi had a great deal on produce. The last time I remember being in Aldi was in 2003 in Marion, Indiana, buying supplies for our annual college camping trip. Aldi was poor on selection, hit-and-miss on quality, and notoriously inconvenient. I was surprised when I went into our local Aldi at how much things had improved. Selection was better on, well, pretty much everything. The basics were augmented by seasonal items, special flavors, and mixed in with a few brands that I recognized. I picked up what I was looking for, and what I needed but didn’t expect to find at Aldi: flavored creamer. A couple days later, I made some Just Love Coffee with the new Aldi creamer. Ken asked if there was something that was different about the coffee, because it was . . . so GOOD! I tasted it, and sure enough, I think their hazelnut creamer was the best I’ve ever tasted! It made me curious: what about other items? So I tried Aldi for a few more things: bread, salad, bagels, cake mix. The quality was not only good, I was surprised again when Ken asked where we had purchased the hamburger buns because they were excellent. So, two weeks ago, I took my Kroger E-mealz list and bought the items at Aldi to compare. Because the E-mealz list is based on what is on sale at Kroger, and Aldi doesn’t have sale prices, I thought it was going to be an interesting price comparison. In every case, the Aldi regular price was the same or better than the Kroger sale price. The items on the E-mealz list that weren’t on sale were much cheaper at Aldi. Exluding double coupons, I believe I could pay about the same at Aldi as I typically do coupon-sale matching at Kroger. But I don’t have to spend hours cutting, filing, pulling, sorting, researching every week. They don’t have everything we need at Aldi (like a good selection of frozen vegetables). We’ll occasionally have to pick up a few items at other stores, but for now, I’m pretty excited about Aldi. Another nice thing about the E-mealz menu plan for Aldi is that if I buy one three month subscription, I can use it repeatedly, because it’s not based on a sale cycle. Aldi has items priced the same every week. I’ve now switched my E-mealz subscription from Kroger to Aldi. And I get a few hours of my life back each week! 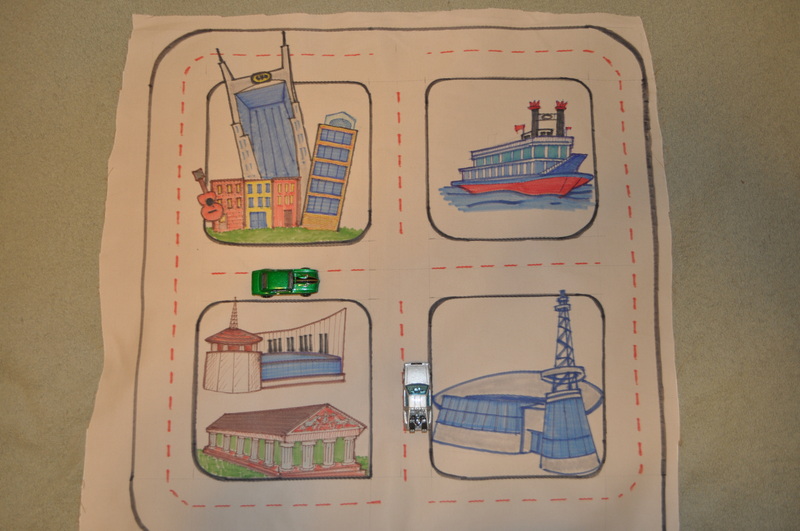 In case you’re not a local, he chose famous sites around Nashville with streets in between. 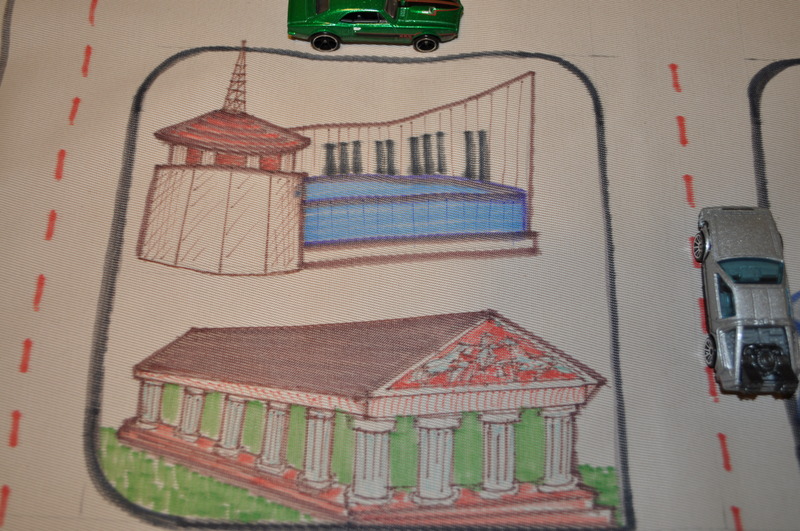 The Parthenon with the Country Music Hall of Fame. 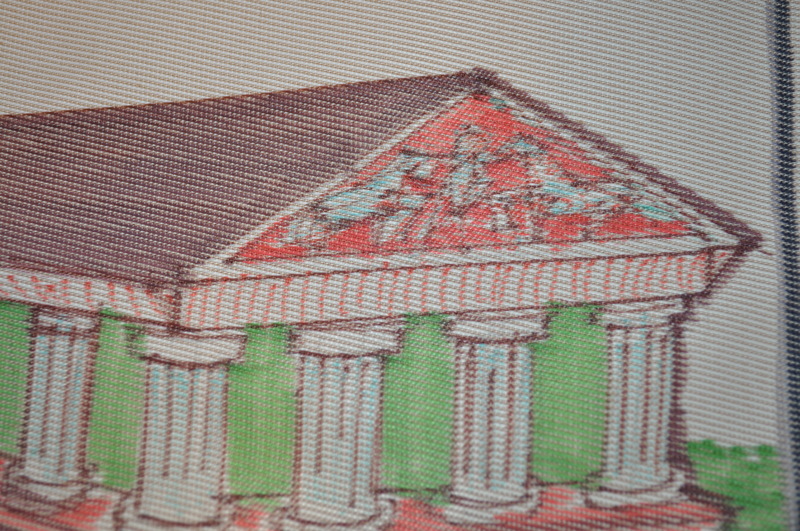 I was especially impressed with the detail on the Parthenon! 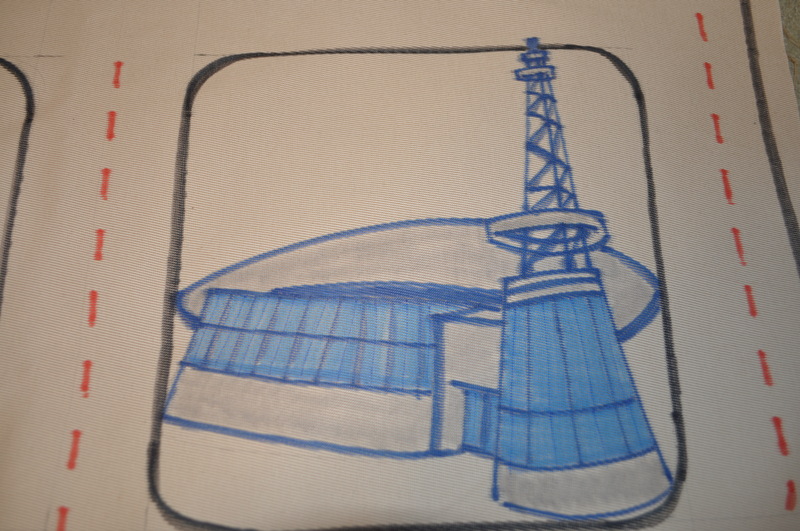 The Gaylord Entertainment Center, the Nashville Arena, The Sommet Center, The Bridgestone Arena. . . 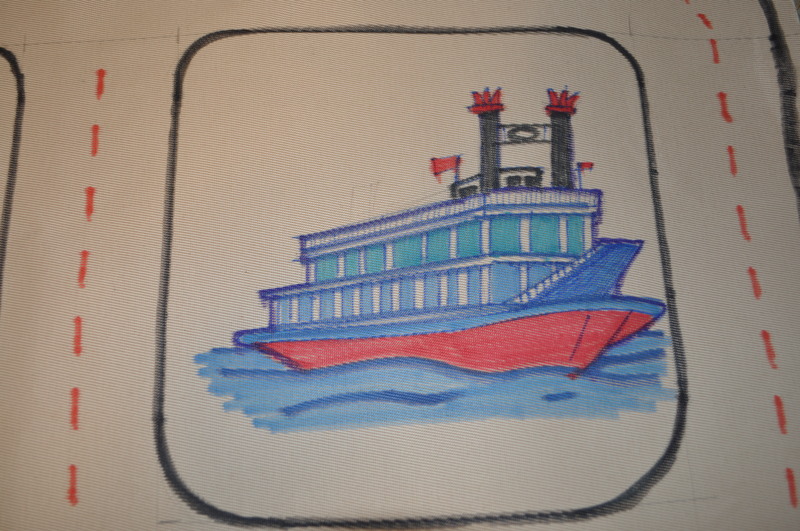 The General Jackson Showboat . . .
And lower Broadway with the Batman Building in the background. Ken even found a couple of hot wheels cars to drive the road in between. 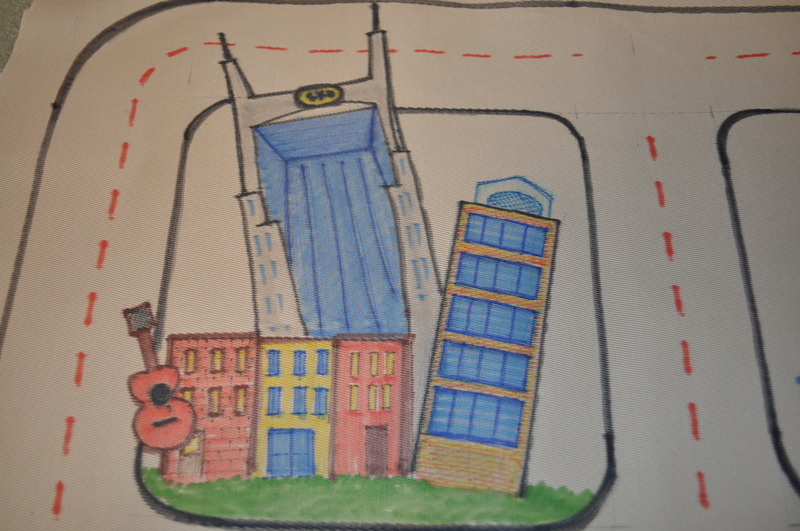 So even while we’re in the DRC, we’ll be able to introduce the kids to Nashville! I LOVE this playmat, and I love my husband who created it even more! 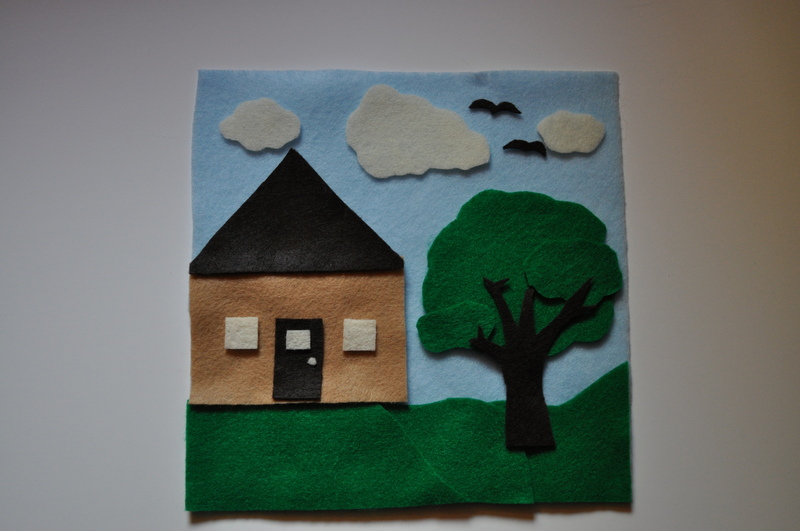 One of my all-time favorite crafts was one that I made over two years ago, and I still use every day. 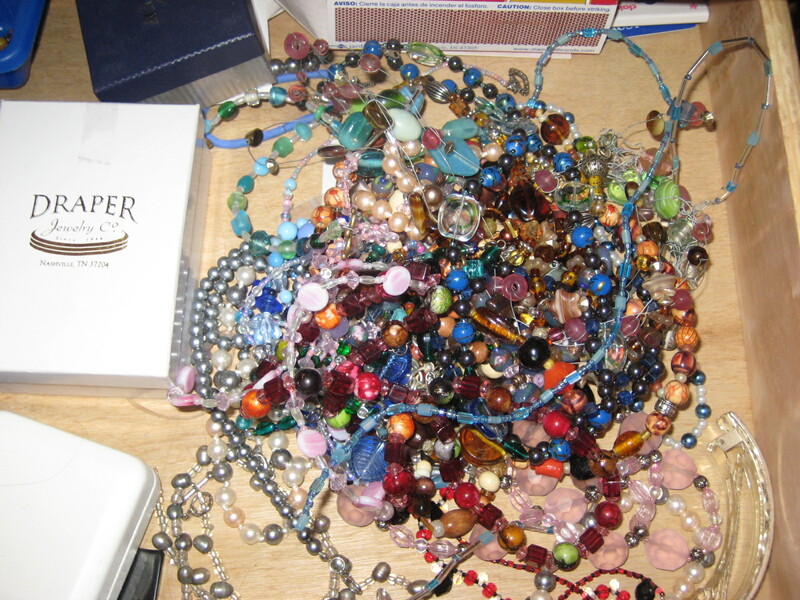 This was my jewelry pile. Not fun. Obviously it’s a tangled mess, and made it hard to find what I want to wear, and even harder to untangle it from the rest of the necklaces. But I had an idea. . . To start, I needed a big frame . . . but a inexpensive frame. Found this 16 x 20 frame at Goodwill. (Where else?) I was not heartbroken to take it apart. 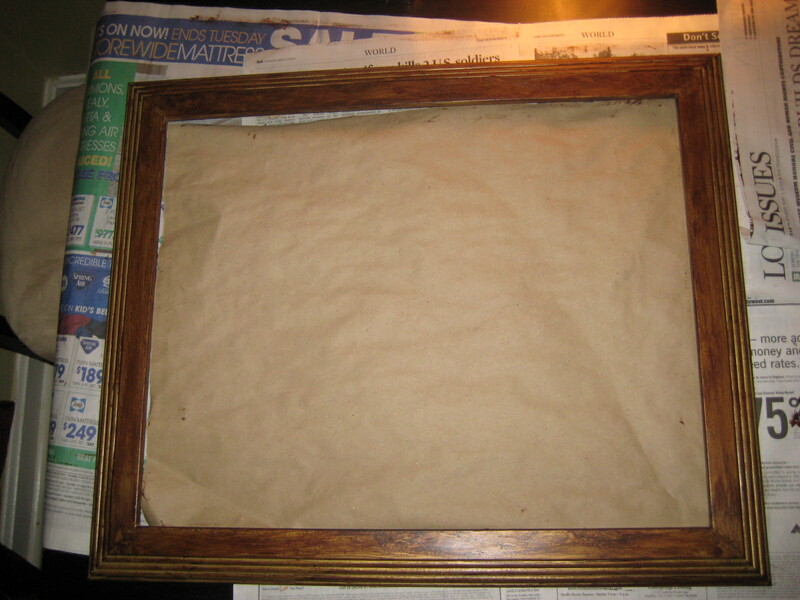 It had a gold finish I didn’t like, so I dry-brushed acrylic paint onto the frame for a textured look. 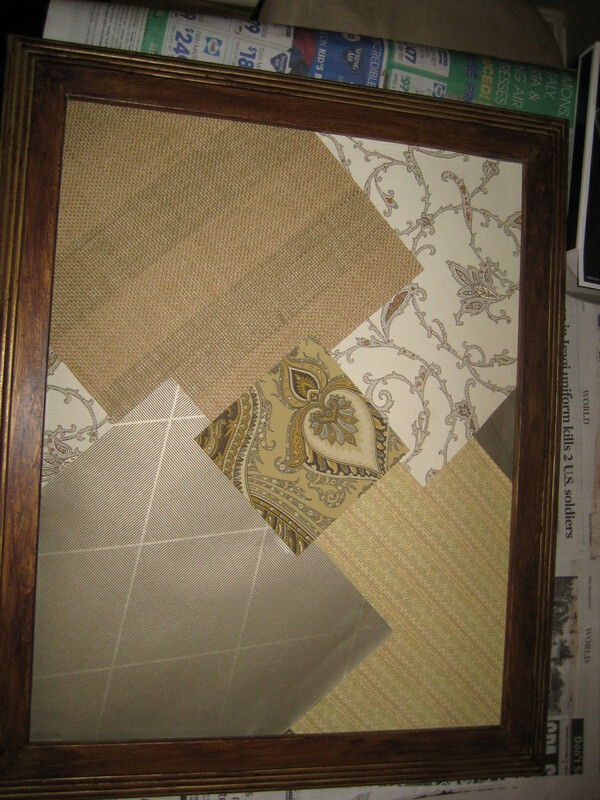 I cut up some wallpaper samples to create a collage of textures and patterns that were color-coordinated, and arranged them on the backboard. 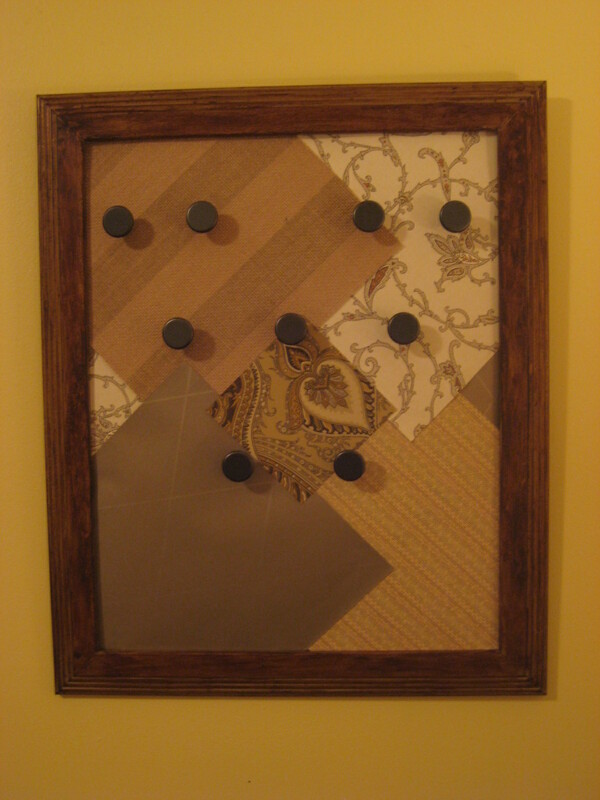 I purchased a cheap set of drawer pulls, and added those to the collage by arranging them in a slightly offset pattern, attatching them with screws through the backboard, and reinforcing them with washers. 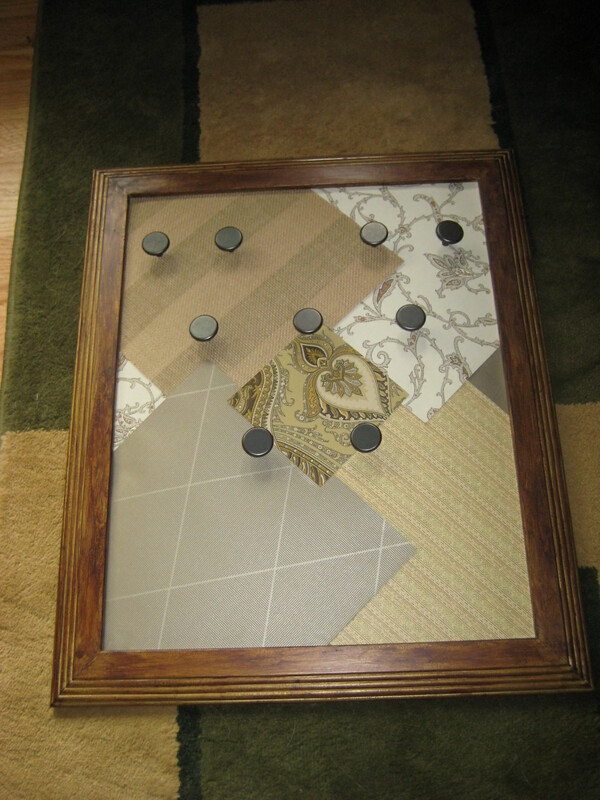 I put the finished board back in the frame and hung on the wall. 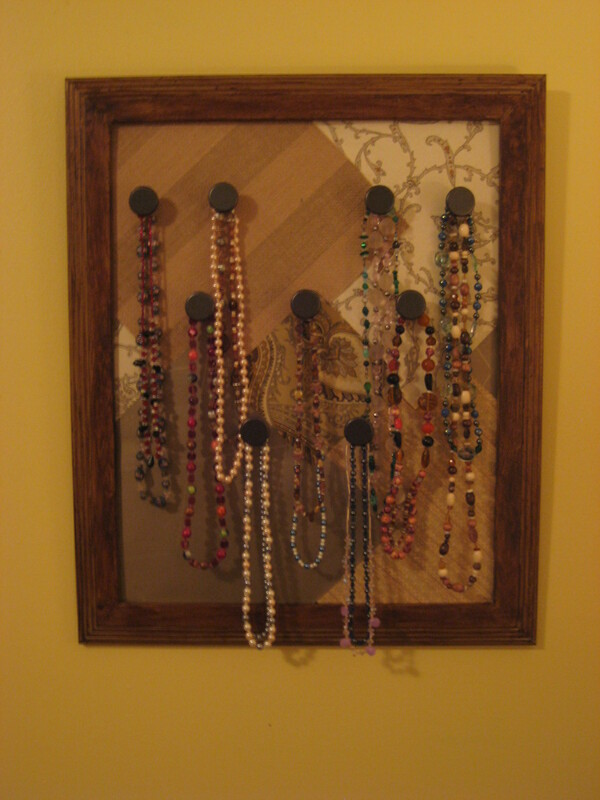 And added my jewelry by hanging them on the drawer pulls. 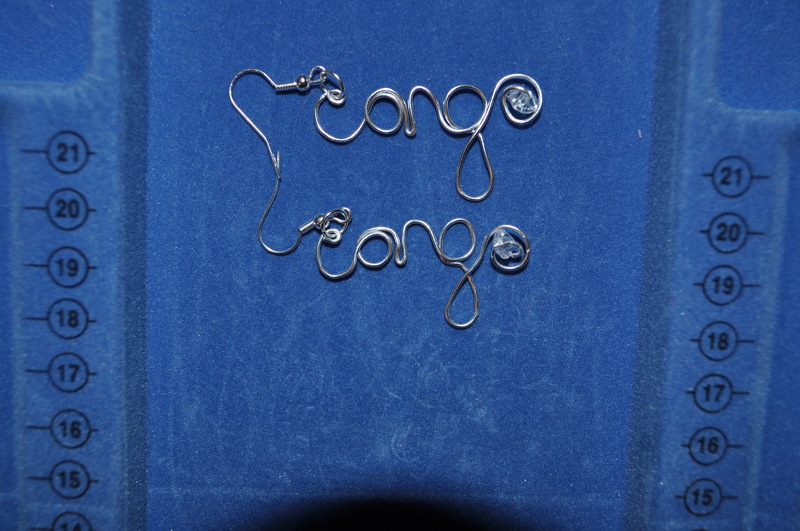 It has served me well for two years, and keeps my necklaces organized and accessible! I came across a post today on keeping your house clean in 15-20 minutes per day. Though the plan would need to be a little different for our house, I thought the balanced approach to housework was well-planned. During Saturday’s 10 minute tackle, I set the stove timer for 10 minutes and tackle one room for 10 minute. When the timer goes off, I reset it, and tackle the next room for 10 minutes, and repeat until all rooms are cleaned. It’s amazing what can be done in 10 minutes! In an hour, I can clean the whole house! That’s one benefit of having a small house! I am also working on a schedule of infrequently repeating special projects, like Goodwill donations, washing windows, planting flowers. 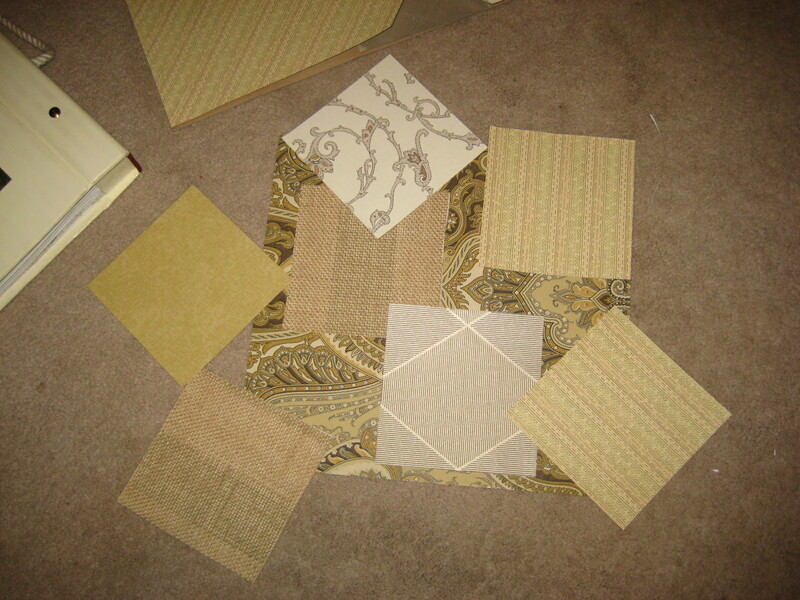 If one special project is tackled each Saturday, it makes all those other projects seem more manageable! So, do you use a Chore Chart or other cleaning calendars? How do you organize your cleaning schedule? How do you keep up with all those projects that you don’t have to do on a weekly basis? One of my stops on my Busy Bag spree was actually Sears Appliance Outlet. Why would an appliance store sell crafting materials? They don’t. But they did have a banner outside announcing that they now sell apparel. Well, I was curious. When I stepped inside, there were dozens of racks of clothing, and nearly everything was $5 (except for coats and dresses). Some items were only $1. My “buy” price for clothing is typically $5 per piece (a dress counts as two pieces– SPLURGE), so I took a look around. What really caught my eye was the little girls’ section. They had some super cute clothes, and none were over $5. I do have heights and weights for both of the kids, so I know approximately what size Rose wears. And if I bought at least 2 sizes too big, surely they’ll be home with us before they outgrow the clothes . . . So I bought this for a grand $5. I think it’s pretty spectacular, especially from an Appliance Outlet! Can you not see this glittery red velvet dress in next year’s church Christmas program?! Then I came across this cute $5 shirt, with a fabric flower on the neckline. I only wish it was 10 sizes bigger! I also found some matching leggings for $3. The sweater was a remarkable Goodwill Outlet find, don’t you think? It’s a very nice heavy sweater in excellent condition, but weighs less than a pound, so I paid about $1 for it. I know that we’re a ways off from bringing our children home, but it’s small things like this that remind me that they ARE coming! I couldn’t resist! The first Busy Bag was from a box of board cards (like individual pages of board books) meant for infants. It was a sample that came in the mail, but I wasn’t sure what to do with it until now. I cut up the different board cards to make puzzles. You can see the cut lines if you look closely at the picture. I put them all in the same Busy Bag, which makes putting them together pretty challenging! You could easily do the same thing with a board book that has been outgrown! Michael’s had felt on sale this week 5/$1. 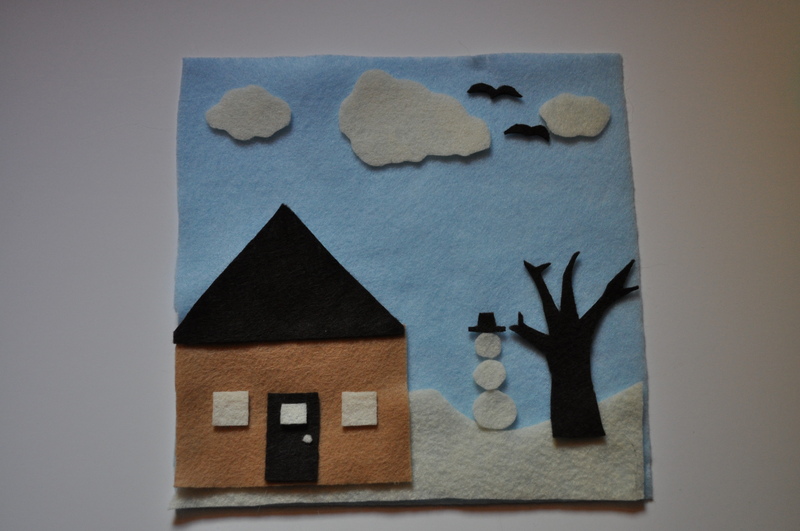 I bought 5 different colors (for this and the next Busy Bag) and created felt scenes — one for summer, and one for winter (or Canadian fall). The shapes can be rearranged and put back together. 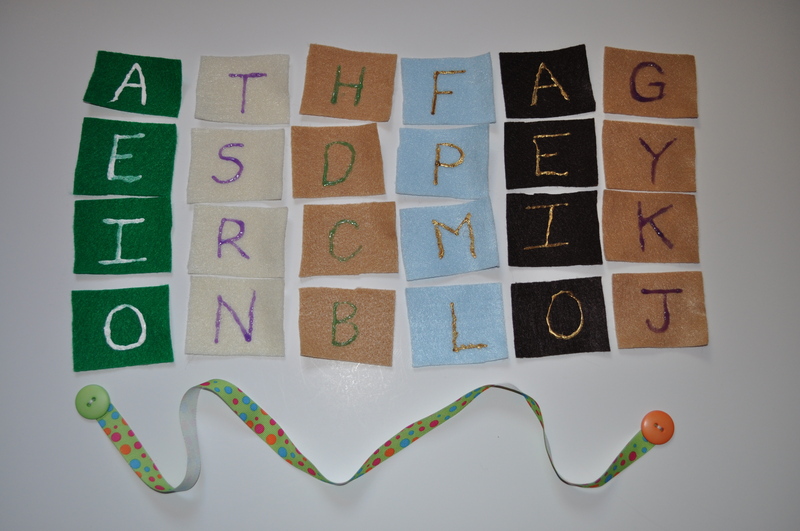 Using ribbon from my ribbon scraps, buttons from my button jar, leftover felt from the project above, and fabric paint from my craft stash, I made a button snake, but wanted to make it a little more interactive as the kids learn letters, and eventually words. 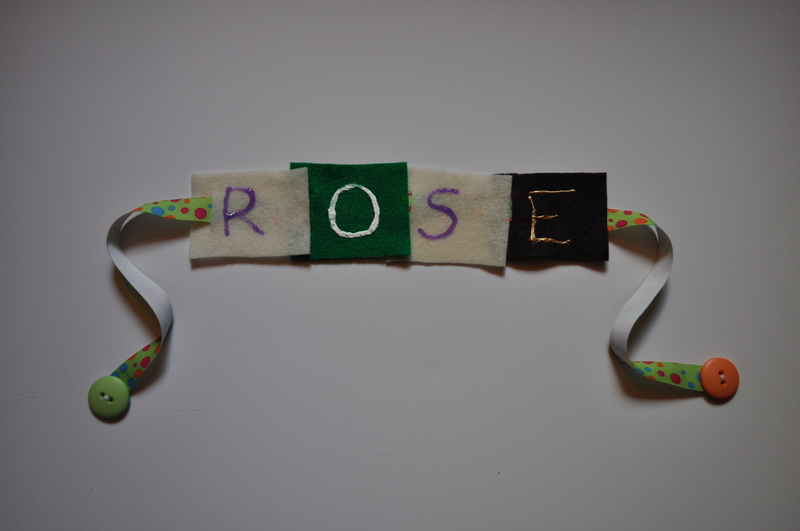 I painted commonly used letters on the felt, rather than using the whole alphabet, so more words can be spelled. So for spending $2 out of pocket, and using some creativity, I came up with four Busy Bag activities. I’ve got some other Busy Bag projects in the works, which are even better, and I’m have a good time putting them together! It will be even better when there are some kids around to use them! Do you love coffee? Perhaps a little too much? I came across this pin on Pinterest last night. We are selling coffee through Just Love Coffee to raise money for our adoption travel expenses. If you love Fair Trade coffee and want to help support our adoption, this weekend’s special is a great deal. Buy three bags of YOUR choice, and they’ll give you one bag of THEIR choice for free! We have LOVED all of their coffees. In fact, when we accidentally ran out of Just Love Coffee in Gatlinburg, we bought some Fair Trade coffee at the grocery store and regretted it! It was terrible compared to Just Love Coffee’s freshly roasted blends. Just purchase three bags at our store, and after checkout, they’ll add a fourth bag. The special is only available today and tomorrow!